Why Do Hospital Generators Keep Failing? The power failure at New York University Langone Medical Center during Hurricane Sandy shows that hospitals still may not be doing enough to prepare for disasters. Exploring Quality of Care in the U.S. It is a hospital's nightmare: The power goes out and backup generators don't kick in, leaving critically ill patients without the mechanical help they need to breathe. It happened in New Orleans after Hurricane Katrina, when hospital staff were on their own when electricity and water cut out. Some died. 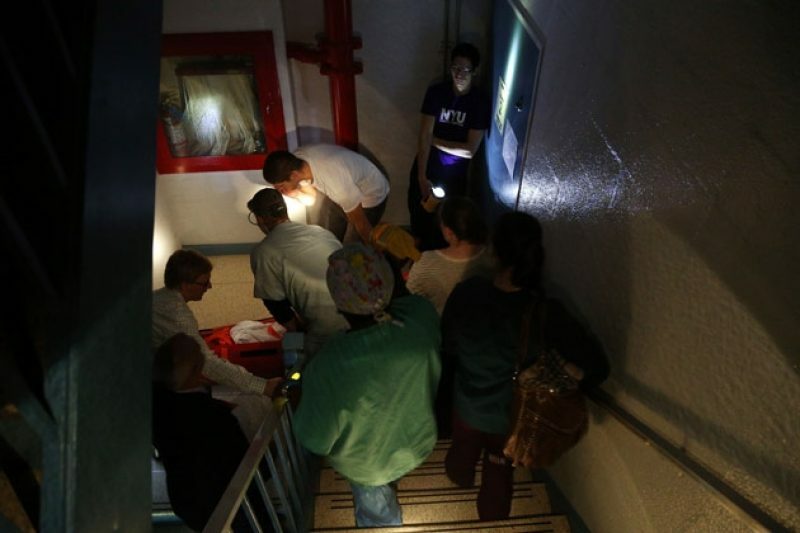 It happened last year in San Diego, when generators at two hospitals failed during a blackout. And it happened last year in Connecticut, when a hospital had to be evacuated during Hurricane Irene when its generator failed. As Hurricane Sandy headed toward the East Coast, New York City Mayor Mike Bloomberg said Sunday, he was assured that hospitals were ready. "The teams from the City Health Department are at these facilities making sure that the emergency generators are working and that they have back-up fuel supplies," he said at a news conference before the storm. In spite of this confidence, the generators at some hospitals did not work as expected. In the most high-profile case, New York University Langone Medical Center had to evacuate all 215 of its patients when its power went out and both of its backup systems didn't work. Staff had to hand pump oxygen to critically ill patients until patients could be taken by ambulance to another hospital. In New Jersey, patients at Palisades Medical Center had to likewise be evacuated in recent days after two generators failed. A hospital spokesman said today that officials were working to bring the "plant up to speed" and could not immediately answer questions about the generators. And this afternoon, Bellevue Hospital in New York City said it is evacuating hundreds of patients because of failing power and deteriorating conditions. "It's Katrina-esque in there," one nurse told ABC News. Experts say such failures are troubling but not entirely surprising. Dr. Arthur Kellermann founded the emergency department at Emory University and headed it from 1999 to 2007. Now, he's Paul O'Neill-Alcoa Chair in Policy Analysis at RAND Corporation think tank. The other night, as the NYU evacuation was unfolding, he tweeted, "Hospital preparedness and well-functioning backup systems are a costly distraction from daily business, until they are needed. Like now." In an email interview with ProPublica, Kellermann elaborated: "I have no doubt when the hospital assured the Mayor that their backup systems were ready, they believed they were. They were wrong. What I find most remarkable about this story is that [more than seven] years after Hurricane Katrina, major hospitals still have critical backup systems like generators in basements that are prone to flooding." Bruce Altevogt, a senior program officer at the Institute of Medicine who has studied crisis standards of care, lauded NYU for safely evacuating patients. But he said the incident should prompt a new discussion about where hospitals place generators and how to ensure they work when they're needed. Newly constructed hospitals are supposed to place their generators and fuel in adjacent locations above flood level. But the location requirements do not apply to already-built hospitals. "These older facilities, it's just an economic issue," Altevogt said. "They don't have the resources, or they haven't devoted the resources to moving the equipment to locations that would be less prone to disasters or flooding in these cases." An NYU spokeswoman told Modern Healthcare magazine Tuesday that "part of the generator is on the roof and part in the basement, which she said took on 8 feet of water. The reason for the failure, she said, is being investigated." New York hospitals have had experiences with generator failures before and have seen the consequences firsthand. In 1987, a 22-minute power failure led to the death of a 40-day-old infant at New York Hospital. "The prematurely born infant, whom officials declined to identify, died after his electric respirator stopped and efforts to help him breathe with a manual air pump failed," the New York Times reported at the time. A decade before that Bellevue Hospital lost all power during the massive New York City blackout in 1977. The Times reported at the time: Doctors and nurses squeezed bags of air with their hands to resuscitate patients when respirators stopped, and emergency generators were brought in." During another New York City-wide blackout in 2003, an official report later said, "Despite prior testing according to applicable State and accreditation standards, [some] generators malfunctioned, experiencing, for example, problems with switches and overheating. ...In a few cases hospitals reported that fuel supplies for generators fell to dangerously low levels, in part because of transportation difficulties encountered by fuel delivery trucks." Back at NYU, a hospital trustee, Gary Cohn, said that the board knew the facilities' generators were outdated and at risk, according to Bloomberg Businessweek. "The infrastructure at NYU is somewhat old," Cohn said in a television interview. The backup generators "are not state-of-the-art and not in the most state-of-the-art location." A hospital spokeswoman defended its systems to the Huffington Post. "Our generators are fully compliant with all state and federal regulations and, using good prudence, we test them all the time as we have to do anyway," Lisa Greiner said. Emails to NYU staff by ProPublica were not returned prior to publication. Another expert in disaster planning, Dr. Dan Hanfling, said in an email that the failure of the back-up power at NYU Langone "is certainly unexpected." "Evidently, the catastrophic failure must be explained by something else," wrote Hanfling, a special adviser for emergency preparedness and response for Inova Health System in Virginia. In his email to ProPublica, Kellermann wrote that the irony of the NYU generator failure is that New York City's hospitals and health department "have taken preparedness more seriously than nearly everyone else in the country, particularly since 9/11/01." RAND tested a novel, no-notice disaster drill at a different city hospital a few months ago and it performed very well. The situation at NYU should be a lesson for all. "Preparedness is not simply a hoop to jump through to satisfy the Joint Commission, or to keep the Fire Marshall off your back," Kellermann wrote. "It is a fundamental duty to the community, state and country. Assuming nothing will ever happen, or counting on your staff to 'rise to the occasion' is not a plan, and it is not preparedness." Hanfling went a step further. "Lesson to learn: hospitals must be prepared to evacuate patients. This may be the 'new normal' for hospital preparedness efforts," he wrote.